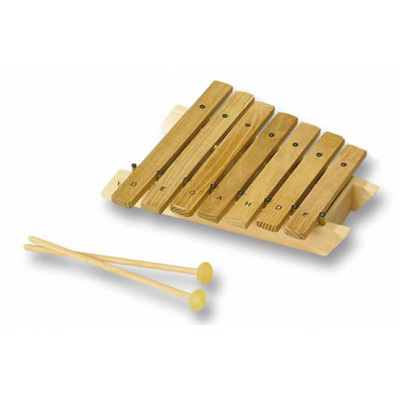 These small Auris Xylophones are securely mounted on a beech wood frame. The sound bars are made of Acacia wood. The beautiful and clean tune comes from their solid construction of precious materials. Comes in a box with 2 mallets. Size: 35 x 29 x 7 cm. These small Xylophones are securely mounted on a beech wood frame. The sound bars are made of Acacia wood. The beautiful and clean tune comes from their solid construction of precious materials. Comes in a box with 2 mallets. These two kinds of instruments reach back into antiquity. Originally stone bars were used which were then replaced with wooden bars and much later a resonance body. The resonance body increases the duration of the sound and the volume. The instrument was brought to Africa through East Indian trading people and to Latin America with the slave trade. It is also said that the Celtic people used a relative of the marimbas and xylophones called a Lithophone (litho=stone) and also used an Amadinda made out of wood.